This weekends Before and After, while the other half was at work. I know he half expects something to change while he is at work. You just never know what it is. Anyway - this old dresser in my son's room needed a face-lift. And I was finished by lunchtime! In a few years, after this dresser is completely kaput, I would definitely invest my dollars in something like this, because it is quality made. In the meantime, I have to use what I have. I chose to do a Navy Blue top instead of the brown because it fits better with my sons room. I think a dark gray or even black would be nice as well. I would never paint an old piece of furniture that is made of real solid wood. This is just veneer and it was starting to peel. To fix the veneer, glue them back down with some wood glue, then I fixed the missing pieces with some filler and sand it smooth. Always do the job right for the best results. I lightly sand to give the paint something to stick to. Remove the drawers & hardware before painting. I used silver spray paint to update the hardware. Use tape if needed for clean lines. Like I said before - I would never paint a quality solid wood piece of furniture and be careful - some veneers are made from quality pieces of wood like redwoods, etc. You don't want to cover up the beautiful grain of something like that. A refinish/stain job will do just fine. Ask if the paint store has some paint that have been mis-mixed or left behind. 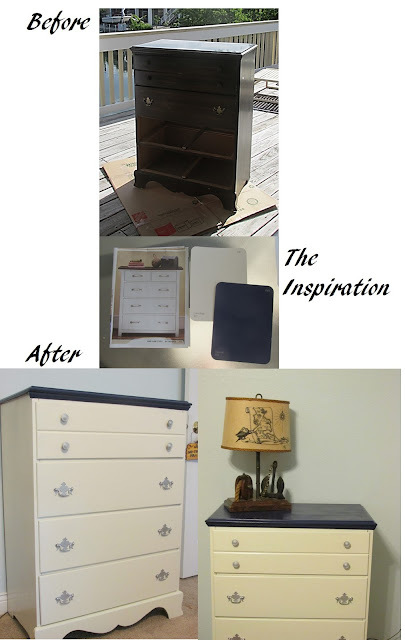 The cream paint for the dresser was $3 because it was mis-tinted. It was an outdoor paint but that is perfectly fine for a piece of furniture, maybe even better. I have found that using a semi-gloss with a primer requires less coats, lasts a little longer, sticks better and cleans up nicely. The outdoor paint worked well, but requires more coats and was harder to clean of my hands. Always do a light sanding to give the paint something to stick to. Nothing major, just dust of the top layer. Change up the hardware for fun, I wanted to use small cleats for the drawer pulls to give it an even more nautical look, but needed my other half's help. Waiting for him to help me with a project is like waiting for it to snow in Key West...it's just not gonna happen! Don't go crazy - Although I love to change my look and paint furniture, not all your furniture in the house should be painted. Having a few solid wood and quality pieces really makes colors pop.